The president of the Spanish Football Federation and his son have been held as part of a corruption investigation, police in Spain say. Angel María Villar Llona was arrested on suspicion of embezzling funds, El Pais and Efe news agency reported. Mr Villar, a former Spain international footballer, has been president of the association since 1988. Spain's High Court told Reuters that one of its investigating magistrates and anti-corruption prosecutors were leading the probe. In Villar's time as president of the federation, Spain's men's football team has won two European championships as well as the 2010 World Cup, becoming one of football's dominant forces. He has also served on the council of football's world governing body Fifa for the past 29 years, but was reprimanded by Fifa for failing to comply with its internal inquiry into the 2018/22 World Cup bidding process. Michael Garcia, who conducted the investigation, wrote that Mr Villar told him: "Well, you really have balls" when the American lawyer refused to reveal who had made allegations against Mr Villar. He also demanded Mr Garcia drop the case "for your own good". Richard Conway, the BBC's sports news correspondent, said the Spaniard's arrest is significant and a clear signal that the many issues surrounding officials who presided over world football in recent decades continue. 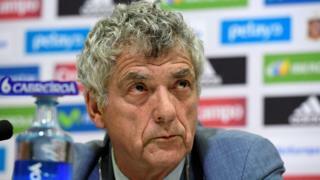 Mr Villar was acting president of Uefa, Europe's footballing body, while its chief Michel Platini was under investigation. He lost out on the presidency in an election last year. Uefa and Fifa said they were aware of the reports. Gorka Villar served as the director-general of the South American football confederation Conmebol before standing down last year. Before standing down, he had been accused of extortion by a number of Uruguyan football clubs.